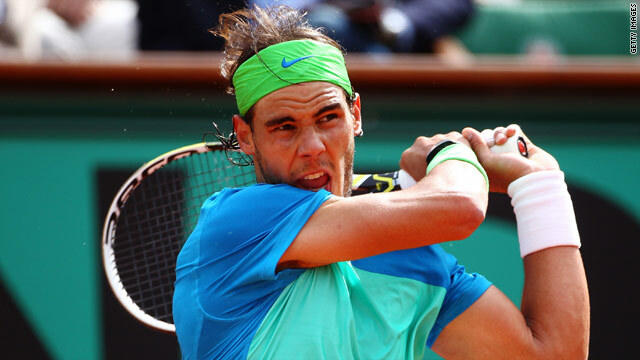 Nadal is looking to become on the second man to win five or more French Open titles. (CNN) -- Rafael Nadal battled past Thomaz Bellucci at the French Open to record his 200th win on clay and set up an all-Spanish quarterfinal with Nicolas Almagro. Four-time champion Nadal was not in prime form, losing his serve four times to the Brazilian, before eventually coming through to win 6-2, 7-5, 6-4 in two hours, 33 minutes. "Every match is difficult in the fourth round of a grand slam," second seed Nadal, who beat Bellucci in the first round in 2008, told reporters. "In Roland Garros every match can be very, very difficult. Bellucci is a very good player, especially on clay. Good serve, good forehand, good backhand, too." Nadal, who suffered his only French Open defeat to Robin Soderling in the last 16 in 2009, remains on course to meet top seed Roger Federer in the final. Seventh seed Verdasco looked jaded as he went down 6-1, 4-6, 6-1, 6-4 to his fellow Spaniard Almagro, who has never got beyond the quarterfinals of a grand slam. Elsewhere, Serbia's Novak Djokovic overcame Robby Ginepri of the U.S. in four sets. Djokovic improved as the match went on, winning 12 of the last 15 games to prevail 6-4 2-6 6-1 6-2. Third seed Djokovic will next face Jurgen Melzer of Austria, who beat Andy Roddick's conquerer Teimuraz Gabashvili 7-6 (8/6) 4-6 6-1 6-4. Melzer became the first Austrian to reach the quarterfinals since Thomas Muster in 1998. "It's going to be a tough match for both of us," said Djokovic. "Physically you have to be very fresh and you have to expect the longer rallies. "But he's very aggressive. He can play defensive and offensive at the same time. So that's what makes him very dangerous. I will try to keep up the good rhythm that I had in last two matches, and the better player will win, I guess."